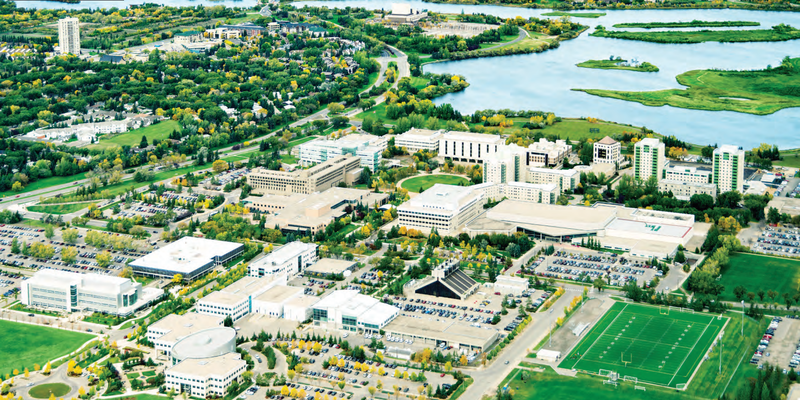 Your pathway to the University of Regina. Our 6-level Academic Program emphasizes the English-language skills you need to enter and succeed in the University of Regina. Before you begin your first semester, you will take a placement test to determine your English level. There are 3 semesters per year; each semester is 13 weeks in length. Levels 005 Low Basic 010 Basic 020 High Basic 030 Intermediate 040 High Intermediate Advanced EAP Dates and Tuition Spring/Summer 2017 Dates: May 1 - July 28 Tuition (Visa Students): $4,050* Application Deadline: April 1, 2017 * $400 non-refundable deposit fee (deducted from your tuition) * $100 non-refundable application fee . ADVANCED EAP Advanced EAP (English for Academic Purposes) prepares you for U of R undergraduate and graduate programs, building your academic, English-language skills and readiness for university. 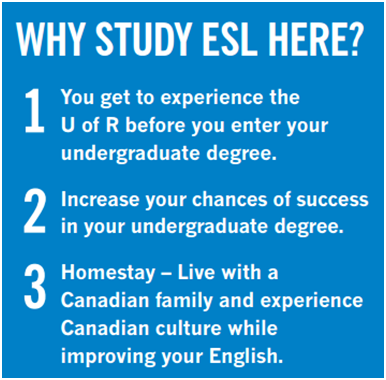 Once you have completed Advanced EAP, you will meet the U of R’s English-language proficiency requirement. Open your World University of Regina international students have a desire to learn more about themselves, the world and everything in it. Study in an academic environment that encourages creativity, innovation, and new experiences. Open yourself to exciting new personal development. Meet interesting people from diverse backgrounds and cultures. Make friendships that last a lifetime. Experience alternative ways of thinking, and learn from others as they learn from you. Discover a future filled with possibilities for you and your career. Enjoy all of these things with the constant support of UR International. Over the past five years, for example, the number of international students studying at the University of Regina has grown by 77%, helping make our campus more diverse than at any time in our history. Students from more than 66 countries now call our University home, enriching the student experience by bringing global perspectives to our campus community. At the same time, more than 800 domestic students have taken advantage of study abroad opportunities to broaden their education in other countries and further develop into “citizens of the world.” All of these students attend the University of Regina because of the quality of our academic programs, and they come here knowing that a comprehensive program of support is available to them through our UR International office. UR International is deeply committed to student success offering academic, social, life skills, and language services that help provide students with the tools they need to make the most of their University of Regina education.